The Eleven-armed Seastar is the largest seastar in southern Australia. 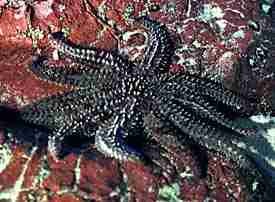 It is a large, distinctive seastar with long arms, usually 11, but there may be 7 to 14 in number. There are rows of spines on the dorsal (top) surface, while rings of pneumatic walking pedicellariae (tubercles) are in parallel rows on the bottom and on top of the arms. The Eleven-armed Seastar is a strikingly beautiful seastar. It is normally blue, with shades of brown, orange, red, cream, mauve, green, grey, and white. The bi-coloured spines may be blue at the base and salmon pink at the tips. The Eleven-armed Seastar ranges from Point Dangar, Queensland, around southern Australian shores to Rottnest Island in Western Australia, including Tasmania and Lord Howe Island. This reasonably common large seastar which occurs at low tide levels and below, found under rocks and wandering over algae in pools. The Eleven-armed Seastar can reproduce itself by self division. They are often found with a set of arms at varying lengths, regenerating to their original length. I have never seen an individual with all of its arms the same length. In 1946 Hale stated that this was undoubtedly the most common intertidal seastar along southern Australia. This sea star is named Coscinasterias calamaria in most of the references below. This name is now reserved for a similar tropical species (Edgar). Bennett, I. (1987) W.J. Dakin's classic study: Australian Seashores. p.348-9, Angus & Robertson, Sydney. Davey, K. (1998) A Photographic Guide to Seashore Life of Australia. p.131, New Holland, Sydney. Edgar, G.J. (1997) Australian Marine Life: the plants and animals of temperate waters. p.347, Reed Books, Kew. Quinn, G.P., Wescott, G.C. & Synnot, R.N. (1992) Life on the Rocky Shores of South-Eastern Australia: an illustrated field guide. p.82, Victorian National Parks Association, Melbourne. Marine Research Group of Victoria (1984) Coastal Invertebrates of Victoria: an atlas of selected species. p.137, Museum of Victoria, Melbourne. Shepherd, S.A. & Thomas, I.M. (1982) Marine Invertebrates of Victoria, Pt. 1. p.416, South Australian Government Printer, Adelaide. Underwood, A.J. & Chapman, M.G. (1993) Seashores: a beachcomber's guide. p.44, New South Wales University Press, Sydney.